The Salvation Army was founded in 1865, when William Booth left the Methodist ministry to preach in the slums of London's East End. In 1878, the Christian Mission Center he established was renamed The Salvation Army. This new name reflected its growing legion of supporters that, by the early 1900's, were stationed in 36 countries. Today, The Salvation Army is active in more than 120 nations, meeting the needs of the impoverished and others who lack a strong voice: the very young, the aged, the frail, sick and disabled. An international movement, The Salvation Army's message is based on the Bible and its ministry is motivated by the love of God. The Salvation Army, a nonprofit organization that started in 1880 and in Buffalo in 1884, was started to help the poor and homeless through gospel preaching and social work. The Salvation Army also helped during the World Wars in over 3,000 places, on and off the battlefield. The Army would provide soldiers with food, care packages and encouragement including writing letters for the troops and from the troops for their friends and family. In 1944, the Buffalo Salvation Army served 175 gallons of coffee along with several thousand donuts, and gave 390 knitted garments to the troops, as well as counseled 6,000 of their families. The Salvation Army became known for The Doughnut Girl, because many of the girls handed out Doughnuts to the troops, as well as sold boxes of doughnuts to help the poor. 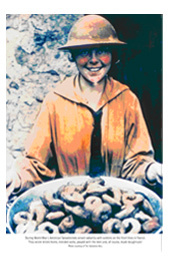 We remember The Doughnut Girl today whenever The Salvation Army distributes doughnuts or food to those in need. In 1865 William and Catherine Booth left the Methodist Church and began evangelistic work in the slums of London, England's East End under the name of the Christian Mission. In 1878 The Salvation Army name and quasi-military format was adopted. Its clergy took ranks such as Captain, Major or Colonel and its members became Junior and Senior Soldiers. Within two years the movement spread to the United States. Arriving in Buffalo in 1884, The Salvation Army conducted its first meeting in Lafayette Square. Today, as always, "With Heart to God and Hand to Man" it serves the community through various locations throughout the city and has become an integral part of the local human service network, providing shelter, clothing, nutritional, social and spiritual assistance to all through its multi-faceted programs and services.